In general if you used an adverb, the chances are high that you used the wrong verb. 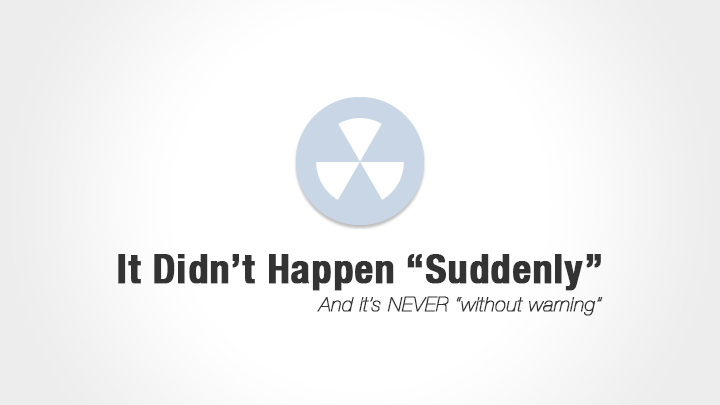 The word “suddenly” is an adverb, and the phrase “without warning” is just a fancier way of saying “suddenly” but with a twist. These two bad boys go deeper than a little writing rule of thumb because they tend to follow certain specific mistakes. You need to know what they are! I would argue that if you felt the need to use “suddenly,” you didn’t build the proper tension leading up to that action. You can give the reader goosebumps. You can cause the reader’s average words per minute to skyrocket with anticipation. But the likelihood of causing the reader to jump out of his or her skin, tossing popcorn all over the theater of your book, is slim to none. You’re trying to get the book to do something it just wasn’t designed to do, so don’t force it! Get the reader to feel the tension building up like a Stretch Armstrong pulled to his limit. When you let it everything snap, the reader’s sweat will be the “suddenly” result you were looking for. I would also argue that nothing is ever “without warning,” and therefore, your story should not try to make it so. Things only seem as though there was no warning, but in retrospect a warning can always be found lurking around a corner. You just have to check the footage of your mind’s security camera to find that little snitch. What is a “warning” in writing anyway? Well, at its basic level, it’s foreshadowing, which is one of the most powerful tools available to you in your writing arsenal! About two months ago, I read a book called “Ship Breaker” by Paolo Bacigalupi. —SPOILER ALERT AHEAD— At the beginning of the book, Bacigalupi writes about a collection of submerged buildings that the characters refer to as “the teeth.” At the end of the book, “the teeth” ends up being what saves them all (sort of). Bacigalupi impressed me with the subtlety by which he mentioned “the teeth,” describing them in just enough detail for me to remember them but not grow suspicious of them. At the end I have to admit that “the teeth” took me by surprise, but they weren’t truly “without warning,” were they? Make your reader feel “suddenly,” not see it. Give warning but make it subtle. Implementing these two principles in your writing will help you build a healthier story that engages your readers! Have you seen this in your own writing, or am I way off base (lemme know in the comments)? I have an ebook coming ridiculously soon! It’s called “I, Storyteller” and it’s going to be completely FREE to everyone who subscribes to my newsletter (which I like to refer to as the Story Lovers Community)! If you’re a “creative,” this book is for you because it will help you to add value, purpose, and direction to whatever art form you practice. You’re going to want to be on this list, so don’t miss out!